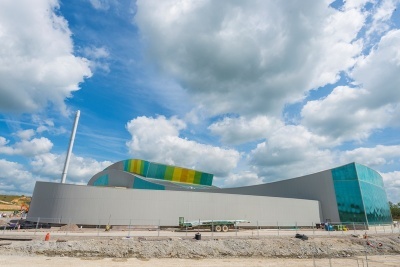 The facility has been constructed to treat 300,000 tonnes of non-recyclable waste each year, diverting at least 95% of Oxfordshire’s residual municipal waste away from landfill and generating enough electricity to power 38,000 homes. The completed building structure is up to 229m long varying from 38m to 70m wide and between 15m and 35m high. Steel was the natural choice for the main frame due to the convex and concave shapes in both plan and elevation, together with clear height and internal space requirements. Although the structure looks like one building, internally under the cladding it is split into several zones, incorporating different designs and resulting in over 2,000 tonnes of structural steelwork being used. With the internal processing plant taking up most of the internal areas, the use of models was crucial to make sure there were no clashes between key plant, equipment and their secondary supports and the main frame. Within the waste bunker, cranes operate at high speeds with high acceleration and breaking forces, together with a grab swing with large pick-up loads. Within this area the crane beams and all connected steel members had to be designed and fabricated to comply with Execution Class 3 requirements due to the high fatigue requirements. These areas were located on top of an 18m high concrete structure which limited access for connections to alongside one elevation only. To overcome this, a removable MEWP platform was designed and constructed to fit on the top of the concrete structure so connections could be accessed. As the internal process plant and associated secondary steelwork for access and support were constructed in advance of the main frame enclosure, the use of modular roof assemblies, some weighing 40 tonnes, had to be used so that the 35m high roof could be infilled with steelwork to allow support for the cladding systems. These modular assemblies were installed using 800 tonne mobile cranes due to having to work over the constructed plant and metalwork areas, and also only having access along one side of the building. The majority of steelwork was hot-dip galvanized to provide the necessary corrosion resistance and low maintenance requirements due to the difficulties in accessing the members whilst the building is in operation. Other areas, mainly accommodation areas or rooms with daily occupancy, were painted with intumescent coatings to achieve the specific fire resistance requirements. The project was delivered on programme and to budget. Steelwork Contractor Bourne Steel Ltd.
A large and highly complex industrial plant has been enclosed by an undulating structural steelwork envelope. Site logistics and difficult construction phasing resulted in great challenges to the fabrication and erection which required modularisation and bold management. The construction above column-free spaces to such a complex timetable was impressive.